The Chicago Harbor Safety Committee has taken a fresh look at marine education and has created a stunning, 35 minute mini-movie that is as entertaining as it is educational. The unique piece offers soaring drone shots of the Chicago's magnificent lakefront, stunning evening shots of lit-up skyscrapers from the Chicago River, and a musical score of electric Chicago Blues. "The premier will happen at 7:00 pm on Thursday, June 29, at Chicago Yacht Club, Monroe Street and Lake Shore Drive. Steeped in nautical tradition, the club is the perfect setting to release this new film." There are no complex diagrams, no check lists, no cartoon characters doing it right or wrong. Instead, there are soaring drone shots of the Chicago's magnificent lakefront, stunning evening shots of lit-up skyscrapers from the Chicago River, and a musical score of electric Chicago Blues. The Chicago Harbor Safety Committee has taken a fresh look at marine education and has created a stunning, 35 minute short film that is as entertaining as it is educational. 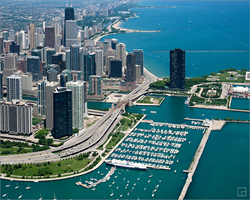 The committee is a consortium of recreational boaters, commercial operations and government agencies that have come together to promote safe boating in Chicago. "Most of the big and small tour boat companies, water taxis, private charter firms and barge operators have joined forces with recreational boating groups, marina management, and government agencies on this project. First to understand the key risks of co-existing on our crowded river and lake front. Then to create joint recommendations about how to best avoid problems so everyone can enjoy our waters safely." said Gary Feracota, Board Member, Chair of the Education Sub-Committee, and Executive Producer of the piece. "It was refreshing to see such a diverse group commit to make things better for everyone. The result of our collective effort over about two years is this phenomenal video." Prominent design director turned commercial mariner, Larry Dostal is the creative force behind the concept, and served on the Board, Sub-Committee and as Writer and Director of the piece. He worked closely with Carolyn James, a film editor and producer well known for her work on various tourism pieces. "Our aim is to promote safe practices to the public in a way that is engaging and informative. This video takes a cue from the renowned Chicago architectural boat tours, and mixes in critical safety messages. Drone views from above and shots from the boater’s point-of-view blend the beauty of Chicago with a more serious perspective of safe boating." Larry Dostal said also, "The video is not a substitute for general boat training courses which we highly recommend. It is created as a supplement to provide very specific local knowledge about boating on our Chicago River and lakefront." "We are very grateful to our sponsors; Chicago’s First Lady, Entertainment Cruises, Marwedel, Minichello & Reeb PC, the Pinnacle Foundation, Pinnacle Yachts, Shoreline Sightseeing, and Wendella Sightseeing.” said Gary Feracota. "The premier will happen at 7:00 pm on Thursday, June 29, at Chicago Yacht Club, Monroe Street and Lake Shore Drive. Steeped in nautical tradition, the club is the perfect setting to release this new film." said Gary Feracota.